This is a 1927 Model #7 LF in Red Ripple with “Pink” color band on the cap and “Pink” imprinted nib. 7 “Pink” LF in Red Ripple! This has become one of the “holy grails” of pendom, because of its wonderful fine, triple-flexible nib. 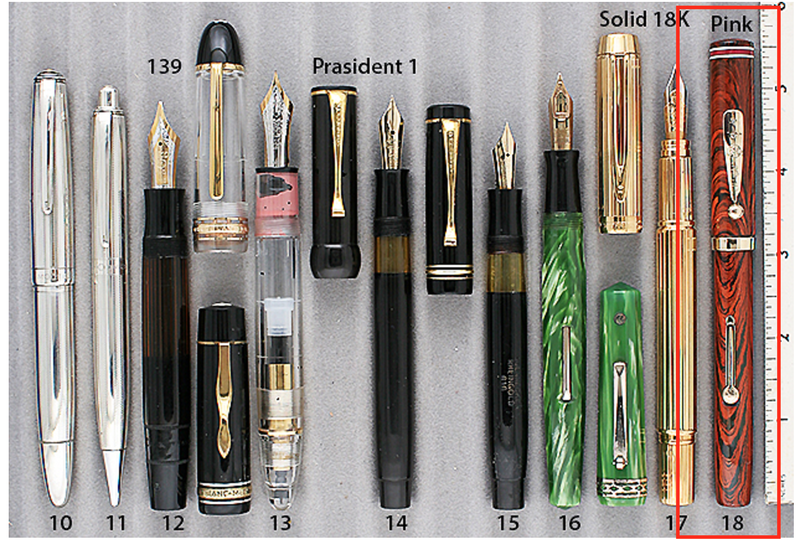 Waterman color-coded their caps and nibs for easy selection of the type of nib the user wanted. This was their answer to the Wahl Eversharp “Personal Point” pens. Item #18 in Catalog #81. This entry was posted in Vintage Pens and tagged Flex, Waterman. Bookmark the permalink. Follow any comments here with the RSS feed for this post. Post a comment or leave a trackback: Trackback URL.